Pattern: Striped Raglan from Ann Budd’s Handy Book of Patterns. I love this book. Yarn: Wool of the Andes from Knitpicks. Colors? Lost the lables, but the light green is avacado. Verdict: Raglans rock. Perfect fit, although I goofed up the stripe sequence a bit, but it still works. Ann Budd, I love you!!! It looks great on you – I love it! Your description of the boys’ behavior during your photo shoot sounds familiar – that’s my kids about 75% of the time, haha. Hey that sounds like photo shoots at my house! It looks lovely on you. It’s really cute on you! Hee hee – I’m glad no one was maimed for the photo shoot. Yet another book I must check out. I am so jaded, it all sounded like you had a lot of background noise!!! Wow – you made that?! Awesome. So pretty. It’s beautiful, and does not look wrinkly at all! The blue is perfect. I know I probably shouldn’t laugh but that is funny and would you want it any other way? It would be boring any other way!! Great sweater by the way!! What a beautiful sweater – I love those stripes! Lovely sweater!! 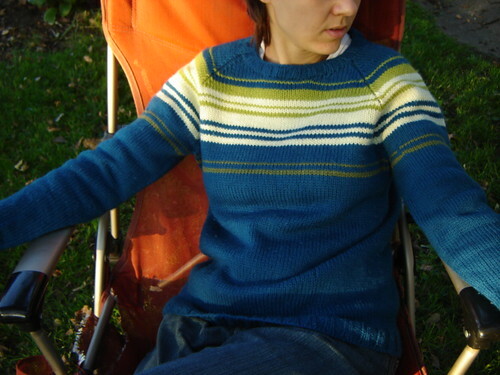 I made a raglan cardigan from that book and it really is so great. Grandma T. would have said you have “cats and pajamja kids”. I don’t know what that means, but I think it would be them. Love your photo shot story! and the sweather is beautiful!! The sweater looks wonderful. I am always amazed at how much you manage to knit with two little kids. I don’t have children and can take pictures any time I want. And they still don’t come out as well as yours. Nor do my sweaters. That is beautiful and the fit is perfect! Nicely done! didn’t I meet that sweater at the Harlot event earlier this year? Fabulous sweater! You’ll miss these days when your children are 29 and 27…really, you will, honest, ROFL. Goofed up the stripe sequence?? You would never know. The sweater is great – and a perfect fit. It looks great! Your stitches are so even. Very nice.